In the written world of sports, no competitor, no matter how skilled, should ever overlook an opponent, no matter how inept. To be fair to the 2015 Western Michigan University football team, they are not an incompetent one. Picked by the media (by one vote) to finish second in the MAC West behind Toledo, the Broncos completed their second regular season under head coach P.J. Fleck with an 8-4 record before losing to Air Force in the 2014 Famous Idaho Potato Bowl, 38-24. With 16 starters returning, among them the MAC’s reigning passing efficiency king, Zach Terrell, it wouldn’t be wise to write them off especially when playing them in Waldo Stadium in Kalamazoo, MI…even if you are the fifth-ranked team in the country, coming off of 42 wins and 4 bowl wins in the last 4 seasons. In the unwritten world of sports, Michigan State simply wanted to escape Kalamazoo with a somewhat resounding win and healthy team so they could finally, openly narrow their focus on the seventh-ranked Oregon Ducks. The same Ducks that soundly beat them 46-27 last season up in Eugene, OR, and put an early dent in the Spartans’ national title hopes. A Ducks team that would be traveling to East Lansing, MI, for this matchup, hopefully going home with their national title dreams seemingly all but lost. MSU’s opponent on Saturday is definitely a strong one, but not quite as strong as the Ducks team that pasted them last year. The catalyst of those Ducks, QB Marcus Mariota, is set to begin his first NFL regular season with the Tennessee Titans, and Oregon lost CB Ifo Ekpre-Olomu, DE Arik Armstead, and SS Erick Dargan among a few others to the NFL as well. Still, Sparty knows this is a matchup between two top-10 teams based on merit so to speak, and not just name. 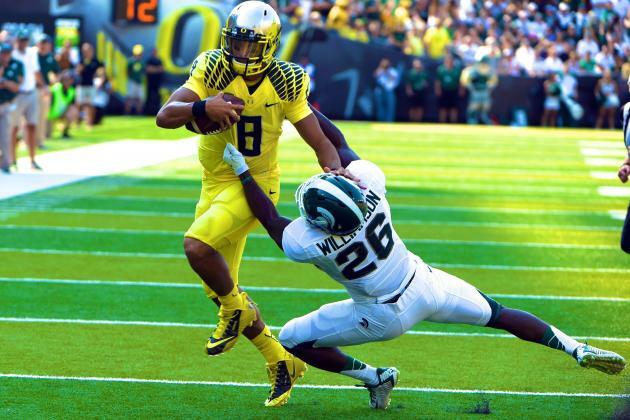 Oregon could have certainly dealt with the loss of Mariota by promoting from within. Junior QB Jeff Lockie backed up Mariota for two years and had a clear advantage on the other returning quarterbacks before spring practice was to begin. Sophomore walk-on Taylor Alie, the team’s holder on field goal and extra-point attempts could have snuck in to win the job. Or, Oregon could take advantage of a somewhat quirky NCAA rule and scour the transfer market for a starting QB, like Eastern Washington graduate Vernon Adams, Jr.
Adams, Jr. spent the last three seasons terrorizing the Big Sky Conference to the tune of nearly 10,500 passing yards and 110 touchdown passes. Not quite the dual-threat QB Mariota was but still plenty dangerous outside of the pocket, Adams, Jr. also managed to scamper for over 1,200 yards at a 4.1 yard per carry clip. Eastern Washington did some winning with Adams, Jr. as the signal-caller, too. As a three-year starter, Adams, Jr. finished his career at EWU with a record of 34-9 and three first-place finishes in the conference. Alas, Adams, Jr. is no Mariota. Hell, he may not even be close considering he racked up such ridiculous numbers against the likes of Cal-Poly, Idaho St., Portland St., and, sorry Spo, UC-Davis. I don’t intend to take away from what he accomplished, but rather provide context to the situation by explaining that in terms of football, the Big Sky Conference isn’t exactly a “Power 5” group. Michigan St. head coach Mark Dantonio knows this. He also knows that Adams, Jr. is surrounded by far superior talent than what he was surrounded by during his time at EWU. There is also the issue of the MSU secondary, and whether it can recover from a rather subpar performance against WMU. Terrell completed 33 of 50 passes for 365 yards and receivers Daniel Braverman and Corey Davis both finished with over 100 yards receiving. It’s important to note that WMU was pressed into throwing the ball so many times because their run game (23 rushes, 18 yards) was basically non-existent, but it’s still worrisome that Terrell and Co. enjoyed the success they did. If the Spartan secondary had problems against WMU, it’s frightening to think of what Oregon’s QB and speedy receivers could do. Hopefully, the game will come down to offense, which is a weird sentiment considering MSU still trots out a starting QB in Connor Cook who is seemingly afraid to complete 60% of his passes and one who didn’t even complete 50% of them against WMU’s defense. Making up for Cook’s inaccuracy is senior WR Aaron Burbridge and the two-headed monster at running back, freshman Madre London and sophomore Gerald Holmes. The three combined for 330 yards of total offense and 3 touchdowns in the season-opening win over WMU and will be counted on even more against Oregon tonight. MSU’s offensive line is still extremely stout in pass- and run-blocking situations and while Cook isn’t a surgeon in the pocket, he tends to not cost his team too many drives and scoring opportunities. MSU won’t throw for 438 yards against Oregon the way EWU did, but Oregon also won’t run for 485 yards against a Sparty defense that for the last several years has been one of the nation’s best against the run. After sacking Terrell 7 times last week in what looked to be a pared-down defense of sorts, it could get extremely hectic very early for Adams, Jr. if MSU’s pass rush proves to be effective. And after beginning his Ducks career at home against a cupcake, Adams, Jr.’s first road game will be a nationally televised, prime-time event in the home of the nation’s fifth-ranked team. The result of this game will obviously mean a lot for both teams, although it’s important to remember that the closer the final score, the less damage and good a loss and win would provide, respectively. A win for Sparty would immediately place them in the conversation of teams with a legitimate (albeit very early) shot at competing for a playoff spot and the national title. A loss for Sparty would…not be good. At all. So, with all due respect to Western Michigan University, a school I spent my first year as an undergraduate at and institution I still have very fond memories of… GO GREEN. GO WHITE. Finally recovered from the best/worst damn Cotton Bowl of my life. Cotton Bowl, Dallas, Texas, January 1, 2015: 5th-ranked Baylor University Bears versus 8th-ranked Michigan State Spartans. 83 points, 21 of which came in the final 12 minutes of regulation. 1,135 total yards of offense. 11 touchdowns. A “fat guy touchdown.” 18 penalties for 180 yards. 54 first downs. A blocked field goal. 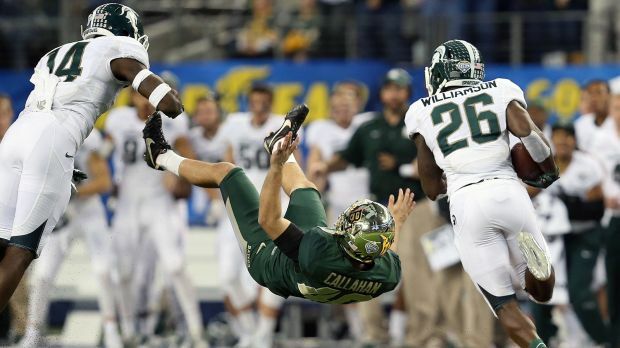 A “Vine”-worthy hit…by MSU WR Tony Lippett. ELATION. Offense: Don’t be fooled by the 552 yards of total offense MSU racked up against Baylor or 258 yards amassed in the first half. After scoring touchdowns on their first two drives, Sparty’s next five possessions ended like this: Punt, turnover on downs, punt, downs, punt. To make matters worse, Baylor scored 24 points after scoring a touchdown on their first possession of the game. Fortunately, QB Connor Cook (24-42, 314 YDS, 2 TD/2 INT) and Co. made just enough plays in the second half as the offense scored 28 points, despite Cook throwing two picks, including this beauty with MSU down 13 and in Baylor territory. With all seeming lost, the Spartans scored 21 in the final 12:09 of the game, tying the game on a 10-yard touchdown pass from Cook to WR Keith Mumphery with 17 seconds to play. To be fair, RB Jeremy Langford (27 CAR, 162 YDS, 3 TD) was once again outstanding, notching his tenth straight 100-yard effort, running for a 1-yard score to bring his team within seven with just under five minutes in the game. Mumphery (4 REC, 87 YDS, TD) was the Spartans’ leading receiver, probably in part due to 1st-team All-Big Ten WR Tony Lippett (5 REC, 74 YDS) splitting duties as a receiver and cornerback (2 TKL, PBU). Nine different Spartans caught a pass, and TE Josiah Price caught Cook’s other touchdown pass, an 8-yarder to make the score 41-27 early in the fourth quarter. MSU finished with 238 rushing yards (131 more than Baylor allows on average) on 46 carries, and Cook was sacked only once. Defense: While MSU ran all over what was a very good Baylor run defense (10th-best run D in nation), Baylor’s run game (29th-best in nation at 215.5 YPG) managed only 38 yards on 22 attempts against the Spartans. That’s the only area the Spartans defenders can feel good about themselves in this game, because Bears’ QB Bryce Petty (36-51, 550 YDS, 3 TD/INT) and the third-best passing offense in the country absolutely tore MSU’s secondary apart. Baylor receivers KD Cannon and Corey Coleman, a freshman and sophomore respectively, caught a combined 15 passes for 347 yards and 3 scores, and six different Bears caught a pass for 25 yards or more. Despite the fact that Petty was able to dissect MSU for over three-and-a-half quarters, soon-to-be University of Pittsburgh football coach (and former (?) defensive coordinator) Tom Narduzzi’s guys were up to the task over the final 21:50 of the game, holding Baylor to 86 yards and zero points on their final four possessions. Petty, sacked five times, was downed twice in a row on the Bears’ final drive to start their possession. On the next play, Petty was picked off by LB Riley Bullough to seal the victory for the Spartans. 1st-team All-Big Ten CB Trae Waynes (3 TKL, PBU) and 1st-team All-Big Ten S Kurtis Drummond (7 TKL, 2 TFL) were part of a secondary that certainly endured their share of struggles during the contest, but made plays at the end when they had to. The front seven helped make Baylor’s offense one-dimensional and was able to get pressure on Petty when it counted most. DE Shilique Calhoun, also a member of the 1st-team All-Big Ten Defense, registered 1.5 sacks, and LB Ed Davis brought Petty down once. 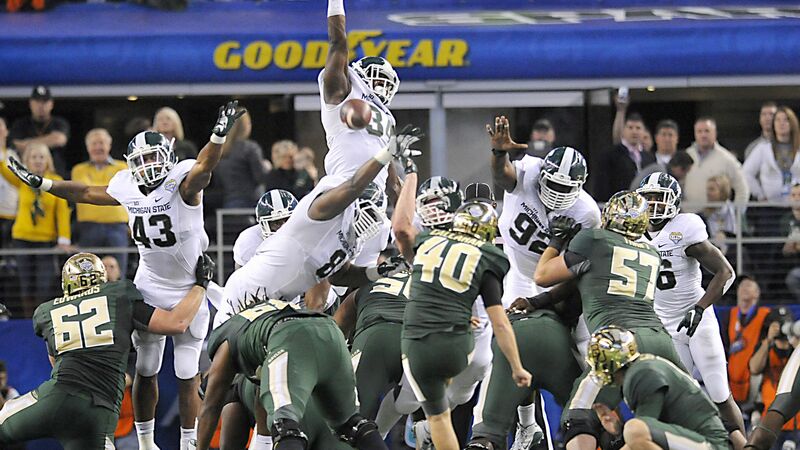 Special Teams: If I were into the grading thing, I would give MSU’s special teams unit an A+ just for this. And also, this. Mainly, the first clip, but the second was some icing on the cake. Even though many will focus on Baylor K Chris Callahan and his blocked kick, Callahan’s 46-yard attempt hit the upright with 14:18 to play. A conversion would have given the Bears a 44-21 lead, and potentially put the game out of reach for Sparty. MSU K Michael Geiger was good on all six of his extra point attempts and the golden-legged god, P Mike Sadler punted only three times for an average of 39.7 yards per boot. 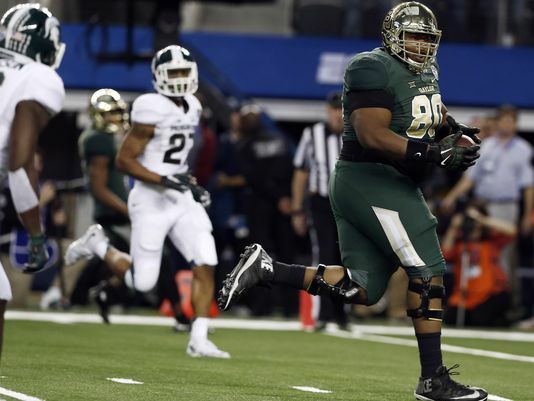 There wasn’t anything out of the ordinary in the return game for either MSU or Baylor. What’s Next: The 2015 season, and whatever that may hold. Junior QB Connor Cook is allegedly set to return, but the team will lose 17 players to graduation, including Lippett, Langford, Drummond, Mumphery, LB Taiwan Jones, and RB Nick Hill. Calhoun could return, as he is a lock to be drafted, but could probably improve his draft status with a more impressive season than the one he had in 2014. Somewhat shockingly, fellow underclassman Trae Waynes has apparently decided to leave MSU early and declare for the NFL Draft, which will definitely leave a void in the secondary should he see that plan through. Sparty is looking to build on a top-35 recruiting class, but will likely count on returning players to carry the brunt of the workload in all three phases of the game. The Spartans’ schedule in 2015 doesn’t look particularly daunting, save for their second game of the season, a tilt against Oregon in East Lansing, and a road game on November 21 to play the Ohio St. Buckeyes in Columbus. 2014’s final 11-2 mark signals the program’s fourth season in five years in which it has won 11 games or more, and “momentum” doesn’t appear to be slowing for head coach Mark Dantonio and his squad. At 17-9, the Chicago Bulls currently sit in first place in the NBA’s Central Division, three-and-a-half games behind the Toronto Raptors (yes, the freaking Toronto Raptors) for the top overall seed in the Eastern Conference. With an expected win-loss record of 16-10, it appears the Bulls are about where they should be in terms of play. One-and-a-half games behind the Bulls in the Central are the reloaded Cleveland Cavaliers (15-10), and once again, the East looks fairly weak, especially when compared to the West. 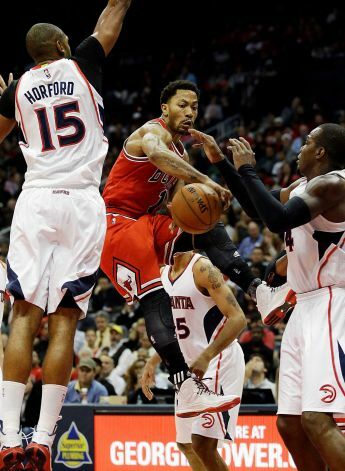 Derrick Rose, doing Derrick Rose stuff. about anyone. A career 46% shooter from the field and 31% from long distance, Rose has never been a sharpshooter, although he’s improved as a shooter since entering the league in 2008. Factoring into Rose’s paltry shooting numbers this season is his shot selection. So far, Rose has attempted a career-low 38.6% of his shots from ten feet and closer. What makes this number so frustrating is that he’s shooting just over 59% in that space on the floor, a career-high mark. From deep, Rose has put up more shots (nearly 6 a game) than any other time since his second year in the league and this season. Not only is this problematic because Rose is shooting terribly from three-point territory, but also because the Bulls are currently second in the league in free throws per field goal attempt. When Rose chucks from deep, he misses nearly 75% of the time, creating easier opportunities for the opponent to get into their transition offense and score quick, efficient baskets. Rose is still knocking the rust off of his game, but he’s been well above-average thus far and should find production at a higher level easier as the season goes on. Twenty-five year-old shooting guard Jimmy Butler entered the 14-15 season needing to improve on a disappointing 13-14 campaign that saw his value plummet and questions arise whether or not Butler could be the Bulls’ off guard of the future. Through 24 games (all starts), Butler has been pretty damn good, and the dreaded “m” word may get thrown around when/if contract negotiations come up this offseason. Averaging a shade under 22 points per night while shooting a very respectable 49% from the field and 33% from deep, Butler has also maintained his status as one of the league’s better defenders. 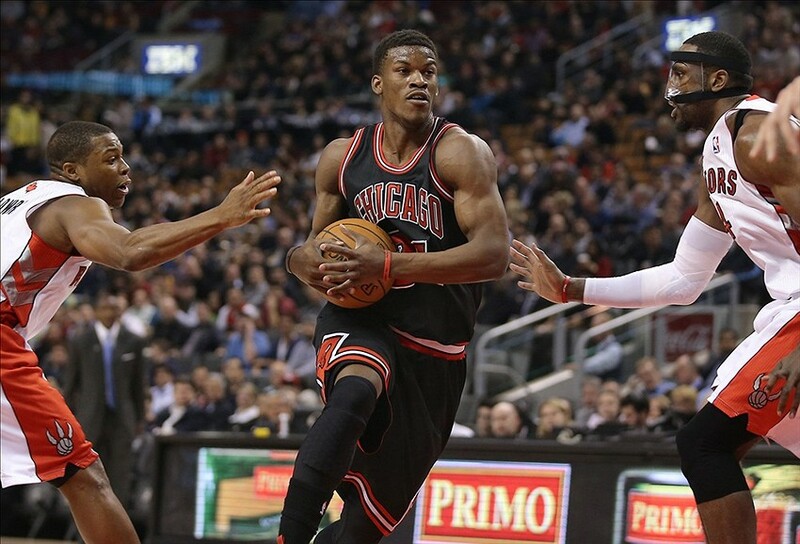 With a VORP that has already reached 5.1, Butler seems on track for an All-NBA caliber season. I never expected Kirk Hinrich to do much when he was re-signed this offseason. And, you know what, he certainly hasn’t on the offensive end. On the defensive end, however, he’s been surprisingly average and dare I say, on most nights, above-average. This still doesn’t negate the fact that he’s shooting 36% from the field (actually down from last year’s 39% and 12-13’s 38%) and has posted a PER of 8.2 and VORP of -0.1, making him damn near valueless in the 28 minutes a night he’s playing. The man who should be most angered by the Bulls’ loyalty to Hinrich besides myself is fellow backup point man, Aaron Brooks. The 6’1″ Oregon product can be added to the list of smaller, backup point guards (Nate Robinson, DJ Augustin) who found a home, and success, with the Bulls. While playing nearly 20 minutes a night, Brooks has averaged almost 11 points a night and just over 3 assists. With a shooting line of (FG%/3P%/FT%) .470/.446/.857 to boot, Brooks has proved to be a wise investment, although he does average 4 turnovers per 36 minutes. Tony Snell probably doesn’t have much of a future with the Bulls, and his performance in limited time this season has not changed that opinion. After a strong summer performance, Snell has apparently fallen out of the rotation and has posted a PER of a measly 5. Backup point guard E’Twaun Moore was signed to essentially fill out the roster and has done just that, picking up some minutes occasionally. Reigning NBA Defensive Player of the Year and 1st-Team All-NBA center Joakim Noah has been slowed by injuries thus far, but has still managed to post (PPG/RPG/APG) 8.7/9.9/4.3 a night and produce at a high level on the defensive end. His field goal percentage and True Shooting percentage have both dropped for the fifth consecutive season, however. Fellow starting big Pau Gasol has been nothing short of spectacular in his first season with the Bulls, averaging 18.2/11.7/2.3 a night. Gasol is also averaging 2 blocks per game and has been much more of an interior defensive presence than I was willing to give him credit for when he signed as a free agent in July. Playing nearly 36 minutes a night, though, could spell doom for the 34 year-old big when April rolls around. Sixth-year power forward Taj Gibson appeared set to be the Bulls’ starting power forward once Carlos Boozer was amnestied, but Gasol signed and Gibson was once again relegated to the bench when Gasol and Noah are healthy. Despite another season of limited opportunities and lack of appreciation, Gibson has been great this season, averaging 12.6 & 7.2 in just over 30 minutes a contest. Still an excellent defender down low and on the perimeter, Gibson has in addition become more aggressive on the offensive end, attempting well over half of his shots at the rim and making 67% of them. Small forward Mike Dunleavy has appeared and started in all 26 games and while he never really gives me cause for excitement, he also never really disappoints me, either. You could probably put Dunleavy on any NBA roster and he’d manage to average 10 points and 5 rebounds a night while shooting close to 40% from three-point territory. Eerie. That’s not a line we usually see from Rookie of the Year winners, but generally, rookies who contend for the award aren’t playing for teams that are legitimate title contenders. Head coach Tom Thibodeau seems to have an aversion to rookies, but most of his rookies weren’t “Niko.” Already a competent defender and very good rebounder, all Niko needs to do is become more aggressive on the offensive side (almost half of his field goal attempts have come from three-point territory), giving the Bulls another weapon on that end. Now, I don’t believe McD is as bad as that line shows. However, when he returns later this season, he’s going to have to contribute on the offensive end, because I simply don’t see him providing much in the way of meaningful value on defense. Cameron Bairstow, NBA player. No, seriously. as he doesn’t have to play more than a few minutes per game. 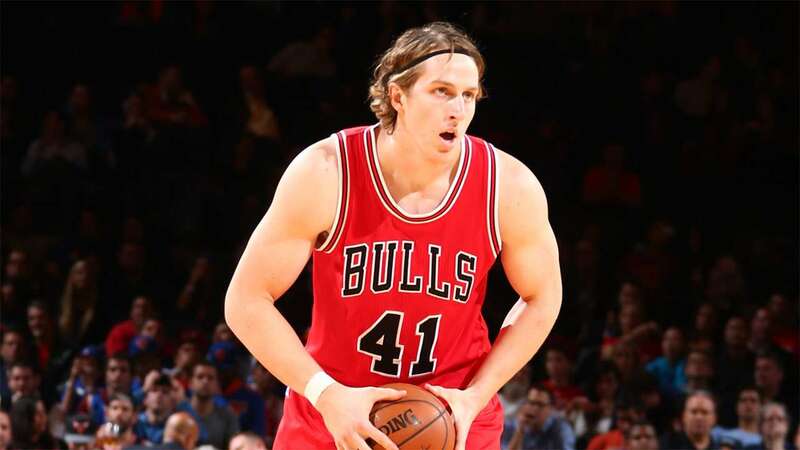 As for rookie big man Cameron Bairstow, I don’t know much else about him except that he makes rookie-year Carmelo Anthony look absolutely svelte, and that he needs to ditch that headbandthing and tube socks. Presently, the Bulls are 15th in scoring (102.2 per game), 11th in scoring defense (98.4), 10th in Offensive Rating (108.4) and 9th in Defensive Rating (104.3). There are still some kinks that need to be ironed out, but most of those kinks have been related to injuries, which in my opinion is a better obstacle to have to clear than inept play. With 56 games left to play, there is still plenty of time for the Bulls to find out just what they are, which I hope is a legitimate contender for an NBA title. J.T. Barrett does not care about your alleged elite defense, people. Okay, so maybe that’s somewhat of a stretch. While the Ohio St. freshman has been very impressive in place of injured QB Braxton Miller, he hasn’t been gunning down top-10, top-20, or even top-50 teams every week. However, all a player can do is execute against the competition and so far, Barrett has done that and then some. I gave the 14th-ranked Buckeyes (8-1, 5-0 Big Ten East) a bit less than a puncher’s chance to escape East Lansing with a victory, and naturally, they went into East Lansing and pretty much trounced my 8th-ranked Michigan St. Spartans (7-2, 4-1 Big Ten East), 49-37. There were 86 points and over 1,100 yards of total offense between arguably the Big Ten’s two best teams, in a nationally televised night game, no less. There are those who will call this win an upset for Ohio St., but that’s really based on ranking, only. Clearly, the gap, if there is one, is not large at all. Offense: You’d think that if the Spartans racked up 536 yards of total offense, in any game, that they’d come away the victor. Right? The problem is that while it appears Sparty’s offense was wildly effective, it actually wasn’t. Jeremy Langford had a great day (18 CAR, 145 YDS, 3 TD), but seemingly wasn’t utilized enough, especially considering MSU was somewhat in the game until early in the fourth quarter. QB Connor Cook (25-45, 358 YDS, 2 TD) continued to struggle with his accuracy, never really getting into a solid rhythm despite posting impressive game numbers. WR Tony Lippett was injured early, and was limited to just 5 catches for 64 yards. Fellow WR Macgarett Kings, Jr. and TE Josiah Price both hauled in 5 passes for a combined 136 yards, with Price hauling in a 16-yard TD catch after the game was pretty much well in hand. The offense did not turn the ball over, but went nearly an entire quarter in the second half without scoring a point, while the Buckeyes scored 14 in that time frame. As a result, the score jumped from 28-24 to 42-24. Cook was sacked only once, but faced good pressure at times. One of the more frustrating moments of this season came late in the second quarter, after the Buckeyes lost a fumble during a kick return. Sparty recovered and three plays later, Langford had a rushing touchdown negated because of a holding penalty. Two plays later, K Michael Geiger missed a 39-yard field goal and on the first play of the ensuing OSU possession, Barrett threw a 79-yard TD pass to WR Michael Thomas to knot the score at 21. Little did I know, the game was basically over at that point. Defense: The defense was absolutely terrible. While I knew Barrett was no slouch, I had no clue he would have the type of game he had, against this MSU D, in what I believe can be a very raucous environment (especially when Sparty is, you know, good). All Barrett did against what was believed to be one of the nation’s top defenses was pile up 408 yards of total offense and 5 touchdowns, two of them coming on the ground. Barrett completed 16 of 26 passes for 300 yards and carried the ball 14 times for 108 yards. Similar to the Oregon game, whenever MSU’s opponent needed a play to be made, it seemed they could just dial up their QB’s number and get the necessary yardage or score. Buckeyes RB Ezekiel Elliott (23 CAR, 159 YDS, 2 TD) was a problem for Sparty, too, as was one of OSU’s top receivers in school history, Devin Smith (6 REC, 129 YDS, TD). Safeties Kurtis Drummond and RJ Williamson led Sparty with 11 tackles each; it’s never a good sign when your safeties lead the team in tackling. DE Shilique Calhoun was relatively quiet, but did manage to register 1.5 TFL and half a sack. My favorite defensive series: In the beginning of the second quarter, OSU faced a daunting 3rd and 23 from its own 36. Barrett completed a 43 yard-pass to Smith. Five plays later, on fourth and goal, Barrett powered it in from one yard away for six. Special Teams: Nothing to report here, except that maybe it’s time for a new kicker? What’s Next: At Maryland (6-3, 3-2 Big Ten East), 8 PM ET. Big Ten newcomer Maryland is just one game behind Sparty in the divisional standings and would love to have its first signature win as a conference member this upcoming Saturday night. Senior Terps QB C.J. Brown has been mostly serviceable as a dual-threat QB of sorts and offensively, there isn’t much behind him in the way of an actual threat. Maryland’s D is not very good, but is probably gleaming after allowing only 19 points in a trip to Penn State. Then again, they did allow 52 the week before in Camp Randall, so it’s possible Maryland is prime to give up another huge offensive output to its opponent. 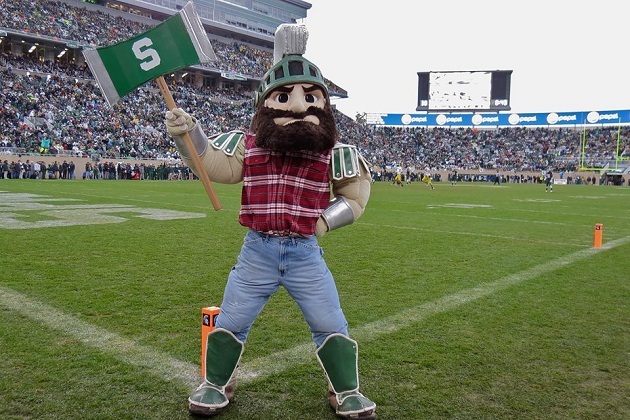 If Sparty doesn’t show up in College Park, MD, seething mad and ready to absolutely obliterate the Terrapins, I’ll be dumbfounded. Sparty’s chances of making the playoffs are over unless something absurdly miraculous happens, but head coach Mark Dantonio will make sure his squad finishes 2014 on a strong note. 31 years old and originally from Ontario, Canada, Russell Martin is a free agent at a very good time in his professional baseball career. Besides the fact that Martin is in a free agent class with fellow backstops J.P. Arencibia, John Buck, Ryan Doumit, Nick Hundley, Gerald Laird, Wil Nieves, AJ Pierzynski, David Ross, and Geo Soto–none of whom is really worthy of a starting job anywhere–Martin’s 2014 season was arguably the best of his career. Offensively, Martin finished with a triple slash of .292/.402/.430 and career-high wRC+ of 140. He also finished with a career-high fWAR of 5.3 and wOBAof .370, both good for third among Major League catchers in 2014 with at least 400 plate appearances. His isolated power (ISO) dropped for the third straight season to .140, but he did manage to rack up a solid 31 extra-base hits in 460 plate appearances while improving his walk rate for the fourth straight season to 12.8%. To round things out, Martin finished 19.4 offensive runs above average, good for fourth at his position. 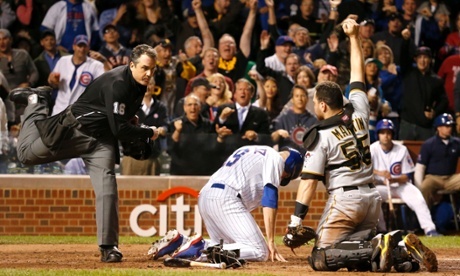 Martin was very good behind the plate in 2014 as well, helping guide a Pirates pitching staff to much success (3.31 catcher’s earned run average, or “CERA”) and the team, a second consecutive postseason berth. Always above average in the run game, Martin threw out 39% of attempted base-stealers in ’14, just a tick off the 40% mark he put up in ’13. He was 14.9 defensive runs above average in ’14, fourth among catchers with 400 PAs, and right behind the 15.3 runs of the Chicago Cubs’ Welington Castillo. In addition, Martin finished second in stolen base runs (rSB) with 6 (again, just behind Castillo), sixth in good fielding play runs (rGFP) with 3, sixth in calculated passed pitches (CPP) with 57, and first in defensive runs saved (DRS) with 12. Although there are a number of teams who would enjoy Martin’s services, most namely the Los Angeles Dodgers and Chicago White Sox, it appears that Martin and the Cubs would be the best fit. The obvious parallel between the Pirates and Cubs is that Martin played with young guys on the Bucs, a number of whom had progressed through the Pirates’ farm system since they were drafted. With the Cubs, Martin would be playing alongside young, fellow “core” guys who have been Cub lifers. As he was counted on to provide stability and leadership in a young Pirates clubhouse, he will likely be counted on to do the same in Chicago, even with the addition of new manager Joe Maddon and leadership of GM Jed Hoyer and club president, Theo Epstein. It appears the Cubs have already met with Martin and it’s easy to assume that Martin came away impressed with the club’s presentation. Cubs catcher Welington Castillo had a relatively fine 2013, but his subpar 2014 could have the Cubs looking at other backstop options. long ago that Castillo would be the Cubs’ catcher of the future. Likely, these things were thought immediately after a 2013 season in which Castillo posted a wRC+ of 107, DRS of 19, and fWAR of 3.3 in 113 games for a very, very bad Cubs team. 2014 came, and Castillo’s production dropped off quite considerably. His wRC+ dropped to 91, DRS to 5, and fWAR to 2.2 as the Cubs began taking their final steps towards baseball respectability. It’s quite possible Castillo could still be the catcher of the future. Defensively, according to Fangraphs, he is still one of the league’s better catchers, and Martin isn’t far ahead of him in that area, even when going by advanced metrics. In addition, Castillo is just a year removed from also showing some of the offensive ability needed to be a productive, everyday catcher, and I can’t believe that has been lost, despite a 2014 for Castillo that simply was not very good. Martin’s offensive production should come with some red flags. Yes, a .402 OBP is very, very, very pretty, but Martin hadn’t posted an OBP above .347 since 2009, when he triple slashed .252/.352/.329 for the Doddgers. His OBP numbers in between 2009 and 2014, you don’t ask? .347, .324, .311, and .327. Those are actually respectably numbers for a regular catcher, but the Cubs wouldn’t be paying for that production. They would be paying more for his 2014 production, through at least 2016, I assume. Managing to hit .290 while being a regular catcher is difficult, but it’s somewhat aided by having a BABIP (batting average on balls in play) of .336, Martin’s highest mark since 2008. Once a strength, Martin is no longer a threat to steal bases the way he was early in his career, when he stole 60 bases in his first 4 seasons. Although you don’t exactly need your catcher to steal bases, I believe his decrease in production in that area is also a sign that he’s lost some of the athleticism that made him one of the league’s better all-around catchers. And while Martin isn’t exactly “old,” he has caught over 9,500 regular season innings to date and has caught in at least 107 games in every year except 2010. The first name that comes to my mind when thinking about Martin in free agency is 30 year-old New York Yankees catcher Brian McCann, who has also caught over 9,500 regular season innings. McCann just endured arguably the worst offensive season of his career after signing with the Yankees as a free agent last offseason, hitting 23 homers in ’14, but failing to post an OPS above .700 and, according to Fangraphs, coming in at 7.5 offensive runs below average. I’m not saying Martin will falter in the exact same way that McCann did, but the term “wear and tear” is associated with catchers for a very good reason. The Cubs have depth on the farm when it comes to position players, but you’d have to venture far down the organizational rankings before finding a full-time catcher, and 27 year-old Rafael Lopez, while the closest to the majors, does not exactly inspire hope. 2014 first-round draft pick Kyle Schwarber caught in 20 of the 72 games he played in his first professional season, but he does not project as an everyday catcher, especially if the Cubs would rather have him on the ML club sooner than later. 21 year-old switch-hitting Victor Caratini came to the Cubs on July 31 in exchange for Emilio Bonifacio, James Russell, and cash, but is at least 2-3 years away from knocking on the Major League door. Also a third baseman, it appears the Cubs would rather Caratini focus on his work behind the plate, as he didn’t make one appearance at the hot corner in his 14 games with the Cubs’ Class A affiliate. What are the Cubs to do? Martin will likely seek at least a four-year contract, wherever he plays. Four years and $64 million seems fair, but he’ll probably wind up getting $80 million over five. The price is right, but the length is a tad long, if I’m Hoyer. However, Martin may very well be a better catcher than Castillo over the next two years and by then, it may be easier to move Martin to second base or the outfield to give him a break during the week (and from all of those terribly draining day games at Wrigley), while also allowing for someone in the Cubs’ system (Schwarber? Caratini? Boise Hawks’ catcher and 21 year-old left-handed hitting Justin Marra?) to begin making the transition to everyday Cubs’ catcher. As I noted above, foregone conclusions are for suckers, but the pieces (Martin, Cubs, money) definitely appear to fit. That’s got to mean something, right? 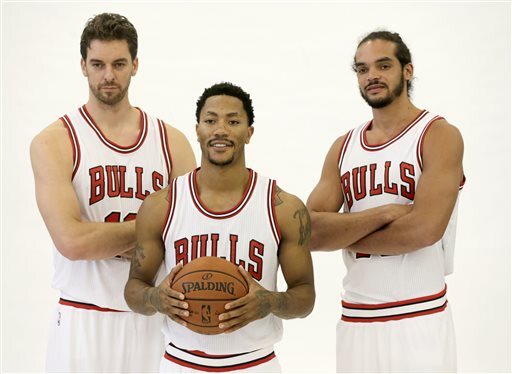 Tomorrow night, the Chicago Bulls will begin their 2014-15 campaign against the New York Knicks. All eyes will initially be on every move of point guard Derrick Rose, who is looking to play his first full, healthy season since his 2010-11 MVP year. When he crashes to the floor, makes a cut, takes a bump, or simply glances at one of his knees, there will be looks of worry on the faces of many fans of both the Bulls and NBA. After the feelings of unease subside, we will be able to see a Bulls team that arguably did more to improve its roster than any other NBA team this offseason except the Cleveland Cavaliers, who signed all-everything LeBron James in free agency and traded away players and picks to the Minnesota Timberwolves for forward Kevin Love. After the Bulls were ousted in the first round of the playoffs by an upstart Washington Wizards squad while playing without Rose and Luol Deng (traded to the Cavs), it was clearer than ever that the Bulls were going to need to add players with offensive firepower. Defensively, the Bulls were and are are the league’s best, but when it was time for a bucket and Rose was unavailable, the Bulls were practically lost as all hell. During this past offseason, it was assumed that forward Carmelo Anthony would sign with the Bulls as a free agent, giving them the scoring punch they desperately needed. “Melo” decided to re-sign with the Knicks (thank God), and the Bulls turned their attention elsewhere. C/PF Pau Gasol (17.4 PPG, 9.7 TRB, 3.4 APG, 1.5 BLK, .480 FG%,.286 3P%, .736 FT%, 102 ORtg, 108 DRtg, .522 TS%, .482 eFG%). The 34 year-old Spaniard signed with the Bulls this offseason after six and a half mostly successful seasons with the Los Angeles Lakers. A key part of two Lakers’ title teams, Gasol’s addition to the Bulls gives them a legitimate 7-footer who can score inside and out, as well as pass the ball proficiently from the low or high post. Gasol represents a significant upgrade over the departed Carlos Boozer, so expect fans to cheer for him just because of that fact. PG Aaron Brooks (9 PPG, 1.9 TRB, 3.2 APG, .7 STL, .401 FG%, .387 3P%, .874 FT%, 105 ORtg, 110 DRtg, .518 TS%, .484 eFG%). Brooks, a former first-round pick of the Houston Rockets, spent 13-14 as a member of both the Rockets and Denver Nuggets, the latter of which he was traded to for forward Jordan Hamilton. The 6′, 160-lb point guard has played most of his career as a backup and will fill that very role for the Bulls. Brooks will have problems on the defensive end, but if he can offensively provide close to what he did for the Nuggets (11.9 PPG, 5.2 APG in 29 minutes per game), the signing will have been a very good one. G/F Doug McDermott (For Creighton: 26.7 PPG, 7 TRB, 1.6 APG, .2 STL, .526 FG%, .449 3P%, .864 FT%, 127.4 ORtg, 106 DRtg, .644 TS%, .603 eFG%) Even though those numbers are from McDermott’s senior season at Creighton, they’re still wildly impressive. He won’t come close to matching them in the NBA, but with an added emphasis on the three-point shot over the years, players like McDermott will almost always have a spot on a roster. If he can use his “sneaky athleticism” to score easy buckets, he could become a viable offensive weapon for the Bulls. F Cameron Bairstow (For New Mexico: 20.4 PPG, 7.4 TRB, 1.6 APG, 1.5 BLK, .556 FG%, .333 FG%, .735 FT%, 122.9 ORtg, 99.6 DRtg, .611 TS%, .558 eFG%) It took three years for Bairstow to become a force at the University of New Mexico, and his senior season put him on the college basketball map. Although he is a bit undersized at 6’9″, 240, Bairstow is a very tough scrapper who will likely need to show defensive prowess to crack Bulls head coach Tom Thibodeau’s rotation. G E’Twaun Moore (6.3 PPG, 1.7 TRB, 1.4 APG, .8 STL, .428 FG%, .354 3P%, .765 FT%, 102 ORtg, 109 DRtg, .513 TS%, .490 eFG%) The Purdue product was signed to give the team guard depth, but hopefully, he won’t be counted on, as that would mean that Rose, Hinrich, and Brooks are out of the mix. G Derrick Rose (15.9 PPG, 3.2 TRB, 4.3 APG, .5 STL, .354 FG%, .340 3P%, .844 FT%, 88 ORtg, 105 DRtg, .446 TS%, .402 eFG%) DERRICK ROSE IS BACK!!! Seriously, he is. After tearing the meniscus in his right knee last season, Rose sat out the team’s final 71 games, electing to let the injury heal as close to completely as possible. He returned this summer to play for Team USA in the FIBA World Cup, where he backed up Kyrie Irving. The US won gold, but Rose did not shoot the ball even remotely well. However, he did seem to play very much under control, showed the burst that made him the league’s most explosive point guard at one time, and most importantly (to me), was an absolute hound on defense. In addition, he dealt with an incredibly grueling schedule without showing signs of wear and tear. With more offensive weaponry to play with, Rose won’t have to offensively bail the Bulls out nearly as much as he did in 10-11, and he should be a much better player for it. C/PF Joakim Noah (12.6 PPG, 11.3 TRB, 5.4 APG, 1.5 BPG, 1.2 STL, .475 FG%, .737 FT%, 111 ORtg, 96 DRtg, .531 TS%, .475 eFG%) Last year’s Defensive Player of the Year (and first-time 1st-team All-NBA member) will have a new starting frontcourt mate in Gasol, which should make his life a hell of a lot easier. Noah put up very good numbers (10.4 PPG, 12.8 TRB, 4.6 APG, .536 TS%) against the Wizards in last year’s playoffs, but on the other end, C Nene Hilario had his way with him. With Noah guarding him most, Hilario went for (points/rebounds/assists) 17.8/6.5/3.25 while shooting 55% from the field as the Wizards won the series in five games. Noah likely won’t match his numbers from last year, but expect him to be a better player on both ends of the floor. PF Taj Gibson (13 PPG, 6.8 TRB, 1.1 APG, 1.4 BPG, .479 FG%, .751 FT%, 102 ORtg, 100 DRtg, .524 TS%, .479 eFG%) Before Gasol signed with the Bulls, it seemed as if Taj would begin the 14-15 season as the team’s starting power forward. Things have changed with the Gasol signing, but Gibson will still be a huge piece to the puzzle. Easily one of the league’s better defenders since he entered the league in 2009, Gibson has also worked to improve his low post and mid-range game. Many of his buckets will come from putbacks and alley-oops, but he is slowly becoming a solid threat from 10-16 feet and his ability to run the floor as a big is unmatched by most. G/F Mike Dunleavy (11.3 PPG, 4.2 TRB, 2.3 APG, .8 STL, .430 FG%, .380 3P%, .854 FT%, 108 ORtg, 102 DRtg, .549 TS%, .510 eFG%) There are certainly Bulls fans who feel McDermott should be starting over Dunleavy at the 3, and for all we know, Thibs may actually start McD over Mike. I’m guessing it won’t happen though, mainly because Dunleavy, while not a good defender, is much more familiar with what Thibs wants on that end of the floor. And what Thibs wants on defense, he gets, or you ride the pine. Although he isn’t a good defender, Dunleavy is a serviceable one, and he is offensively skilled enough to keep even a good defense honest. G Kirk Hinrich (9.1 PPG, 2.6 TRB, 3.9 APG, 1.1 STL, .393 FG%, .351 3P%, .768 FT%, 100 ORtg, 102 DRtg, .494 TS%, .461 eFG%) Hinrich isn’t a bad guy. I don’t dislike him. I’m pretty sure he’s well-respected among his family, friends, and peers. But, damn, there wasn’t another backup guard available? Does Hinrich have incriminating photos of Gar Forman or John Paxson? Both? There was a time when Hinrich was an above-average player, but those days are long gone. Let’s just hope that Hinrich gets in the way of opposing ball-handlers and shoots at least 40% from the floor. G/F Jimmy Butler (13.1 PPG, 4.9 TRB, 2.6 APG, 1.9 STL, .397 FG%, .280 3P%, .769 FT%, 108 ORtg, 100 DRtg, .522 TS%, .446 eFG%) Make no mistake about it: Butler couldn’t hit a shot to save his life during the 13-14 season. With Rose out due to injury, more of the onus to score fell on Butler’s shoulders than should have, and the result was a paltry 39.7% from the floor and sub-30% from deep. Despite his shooting woes, Butler still made the NBA’s All-Defense Second Team and for the second straight postseason, averaged more than 17 points per game. If Butler becomes even a league-average shooter from the floor and three, the Bulls’ offense will be even more potent. G Tony Snell (4.5 PPG, 1.6 TRB, .9 APG, .384 FG%, .320 3P%, .756 FT%, 97 ORtg, 104 DRtg, .489 TS%, .469 eFG%) Snell had a great summer and must be looking to carry that play over into the regular season, because he shot the ball terribly this preseason. At 16 minutes per game, Snell played more as a rookie than I predicted, and if given the same playing time, could prove to be a very effective scorer. He and McDermott will make the reserves a good offensive unit if they’re knocking down shots and slashing to the basket. Also, Snell has the length and athleticism to be a good defender in the Bulls’ system, provided he realizes that when on the defensive end, one’s focus should be on defense. C/F Nazr Mohammed (1.6 PPG, 2.2 TRB, .3 APG. .4 BPG, .429 FG%, .533 FT%, 90 ORtg, 97 DRtg, .445 TS%, .429 eFG%) Chicago Public Schools (Kenwood Academy) product Nazr Mohammed returns for his 17th NBA season. At the age of 36, he will be counted on to give Jo, Pau and Taj breathers whenever necessary. Nazr can’t be counted on to do too much, but he is long and an adequate rim defender. Outlook: Despite the fact that many “pundits” and “experts” are picking the new-look Cavaliers to win the Central Division and Eastern Conference, I firmly believe the Bulls will come away with those titles. While the Cavs look impressive on paper, Kyrie Irving and Kevin Love still seem allergic to defense and outside of LeBron, Shawn Marion, and Anderson Varejao, there doesn’t seem to be a player on the roster who is even an okay defender. The Bulls team that reached the 2011 Eastern Conference Finals was one that had only one real offensive threat, and that was Derrick Rose. This Bulls team has Rose, Gasol, McDermott, Mirotic, Brooks, and don’t forget Noah, a big capable of dishing out five assists a night. All of those players are at least fairly capable of creating for themselves, and all of them except McDermott are more than equipped to create for others. Combine the newfound offense with a staunch defensive mentality and I believe we have a Bulls team that could prove itself better than the Cavs when all is said and done. Obviously, the games must be played, but it shouldn’t take long to figure out that when healthy, this Bulls team should be considered one of the favorites to win it all. Yesterday in East Lansing, for the sixth time in seven games, 8th-ranked Michigan State (7-1, 4-0 Big Ten East) beat Michigan (3-5, 1-3 Big Ten East), only the second time the Spartans have accomplished this feat since the series began way back in 1898. Winners of 14 straight Big Ten games, Sparty is looking like a team aiming for a playoff berth, and also one that is slowly establishing itself as a legitimate national championship contender. Offense: MSU racked up 446 yards of total offense, 219 of them coming on the ground. RB Jeremy Langford (35 CAR, 183 YDS, 3 TD, LG 27) was an absolute workhorse, running for two touchdowns in the first half before running for a third late in the fourth quarter that cemented the final score. Of course, hurt Michigan fans claimed that MSU was running up the score, which humors me. On the previous drive, Michigan ran their offense through and through, scoring a touchdown and to cap it off, actually attempting a two-point conversion, which was successful. The final drive for MSU was the Jeremy Langford Show, as Langford was the only Spartan to touch the ball, running the ball 7 times for 48 yards and that touchdown which hurt the feelings of so many dedicated Wolverines fans. QB Connor Cook (12-22, 227 YDS, TD) was pretty good (not that he needed to be great against this Michigan team) and WR Tony Lippett caught 3 passes for 103 yards, including a 70-yard TD catch in the third quarter. Sparty picked up 22 first downs and converted half of their third down opportunities, but committed two turnovers, which led to 11 Michigan points. in terms of scoring. Michigan couldn’t pass. Michigan couldn’t run. Michigan couldn’t block. I’m also pretty sure there were a few times when Michigan’s coaches couldn’t properly signal a call to their QB. Wolverines QB Devin Gardner and the rest of the offense were downright pitiful in the first half, amassing only 37 yards of total offense, all of them coming through the air. WR/TE Devin Funchess was a non-factor despite a respectable 5 catches for 64 yards and the Wolverines’ top two backs combined to run 20 times for only 74 yards. Michigan was able to score points in part because of MSU turnovers, but besides that, was no match for the Spartans’ defense. The Wolverines finished with a scant 186 yards of total offense while committing three turnovers. Michigan didn’t put together a drive of more than 25 yards until more than midway through the third quarter and never got into anything resembling a rhythm. Spartans LB Taiwan Jones (8 TKL, 2TFL, SK, INT, PBU) was in another world all game long, even managing to avoid being ejected in the third quarter for a targeting penalty that was later withdrawn. DE Shilique Calhoun (3 TKL, TFL, SK) registered his sixth sack of the season and LB Darien Harris had another strong game, finishing with 7 tackles, one for loss. Special Teams: Spartans K Michael Geiger missed a 36-yard attempt in the first quarter, another ode to the greatness that is college kickers. P Mike Sadler punted 4 times, landing one inside the 20. There wasn’t much going on in the return game for any of the men deep for MSU. Somehow, Michigan’s Matt Wile made a 48-yard field goal. If only he would have hit another 8, our “big brothers” would have won. 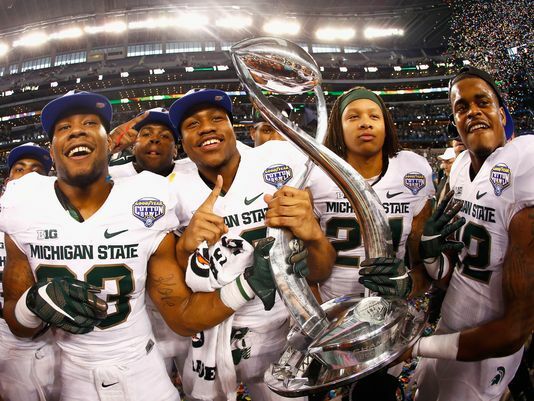 What’s Next: Ohio State (6-1, 3-0 Big Ten East), in East Lansing, November 8 @ 8 ET. Ohio St. beat Penn St. (4-3, 1-3 Big Ten East) 31-24 in double overtime yesterday after blowing a first-half 17-point lead. Buckeyes QB J.T. Barrett was 12-19 for just 74 yards and two interceptions. He hadn’t performed that badly as a passer since OSU’s loss to Virginia Tech, but he did manage to run for 75 yards and 2 TD, including the go-ahead TD in the second extra period. Penn St. came into yesterday’s game a top-10 team in the country in total defense, and held OSU to just 290 yards of offense, a number Sparty should certainly aim for. The Buckeyes are a half game behind the Spartans in the division standings and a win would virtually guarantee them a berth in the conference championship game, provided they don’t falter later in the season. Trust that Spartans HC Mark Dantonio has stressed to his team that this rematch of last year’s conference championship game is important, not just for division and conference standing, but national standing as well. A prime-time win over a top-15 Buckeyes team (albeit one without injured star QB Braxton Miller and a still-improving offensive line) would really help their chances for a playoff berth, especially since they’ll finish with relative cupcakes in Maryland and Rutgers before Penn St., and then the Big Ten title game. It appears that whatever ailed MSU in their wins over Purdue and Nebraska has been fixed, at least for the time being. This is definitely trouble for an OSU squad that will play a night home game this Saturday against an Illinois group that didn’t quit in a 10-point road loss to Wisconsin two weeks ago and just yesterday beat Minnesota, handing the Golden Gophers their first conference loss and knocking them out of first place in the West Division standings. If Miller were healthy and playing, I would give the Buckeyes a puncher’s chance to beat the Spartans, in East Lansing, at that. Without him, the offense won’t be able to overcome a Spartans defense that hasn’t had problems stopping anyone outside of Oregon and briefly, Purdue (yes, that Purdue). We’ll have the pizza ready for you, Urban.